Canadian photographer, digital artist and sculptor Douglas J. Fisher, with Jeremy Humpherville, created this beautiful wood sculpture collaboration entitled Ocean Odyssey. 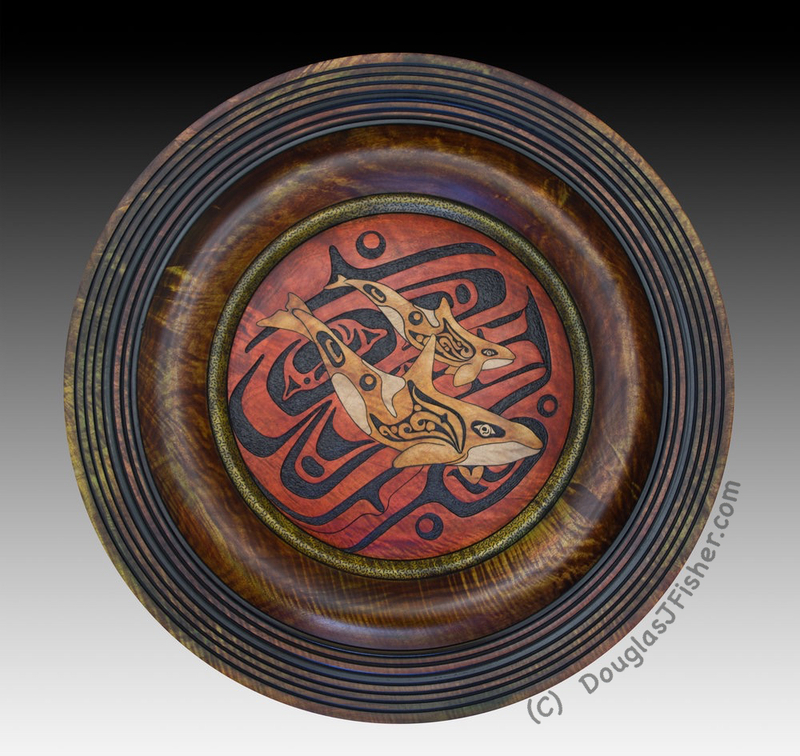 I love the antiqueness of the wood combined with the Tlingit northwest art style and colors in the mandala-like center. I chose this piece because of the bright orange background and how it beautifully enhances the black design elements and the lighter brown colors of the orcas. Only after I added this image to today’s post did I realize the lovely synchronicity of the whales in relation to yesterday’s Orange You Glad Mandala of the Day post. View more of Douglas’s wood sculptures via his online gallery. The killer whale (also known as Orca or Blackfish) is an important medicine animal to the Native American tribes of the Northwest Coast. Killer whales are considered a particular symbol of power and strength, and catching sight of one is considered a momentous omen. Some tribes, such as the Tlingit, view the killer whale as a special protector of humankind and never hunted killer whales (although they were accomplished whale hunters of other species.) The Kwakiutl tribes believed that the souls of marine hunters turned into killer whales upon their death, just as the souls of forest hunters turned into wolves. For this reason, there were a number of special rituals regarding the killing of a killer whale, so that its spirit could be reborn as a human once again. Use today’s MotD as inspiration to connect with, embrace, and express our own inner strength and power.